Like most things that comprise the album Soul Wide Open, the new CD from Katrin Roush, who prefers to go by just her first name, the up-tempo first track “Steppin’ Stones,” tells you a lot about the Massachusetts based artist who has kept putting one foot in front of the other and kept rising above difficult circumstances that life sometimes put in her way. “One Year’s Time,” perhaps the most poignant and personal song on the record, talks about going through life changes that the singer / songwriter did not think that she could bear and the uplifting chorus, one of hope, speaks to the need to keep moving forward, to rising above the pain and emerging on the other side, not necessarily the same, but rediscovering who we are at that moment and who we can be. 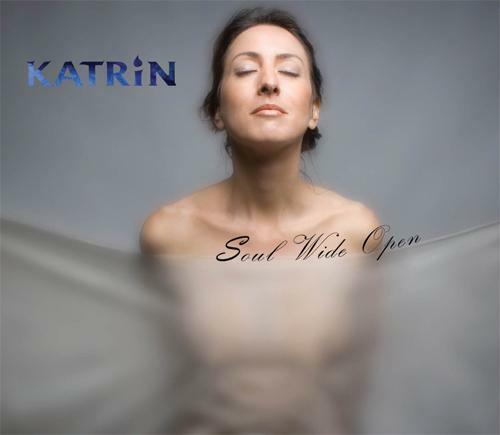 The album cover for Soul Wide Open pictures Katrin, as nature brought her into this world, without clothes, behind a sheer sheet and leaning forward. The photograph by Jonathan Lucas is tasteful versus being sensational or voyeuristic. Katrin says that the cover art reflects who she is and her music. “I was trying to think of a way to convey what my music sounds like and also capturing a little bit of my inner spirit. Jonathan Lucas came up with the front cover art and I was a little bit leery, because I was like ‘What do you mean that I am going to stand behind a sheet and I am going to lean into it?’ I thought that I would give it a shot, but then when I look at all the other photos that he took; I said that one really is me. It is pure and simple and it just says open. It says to me that I am putting myself out there and that I am open. I liked the simplicity of that,” says Katrin. “(Soul Wide Open) is a personal journey. It is personal in a lot of ways from start to finish. My life went through a lot of different transitions. I started off with an idea about what songs I wanted to record and I consulted with Scott Tarulli about doing some production for me, but there were other songs that were direct reflections of what I was experiencing in my life. I was able to take some of the songs that I had done earlier and as my life started to unfold, I started off with an idea of what songs I wanted to record. and then I collaborated with Scott Tarulli on production. We had decided on some songs, but there were other songs that I wrote in the midst of recording the CD that were direct reflections of what I was experiencing in my life. I was able to take some of the songs that I had decided on earlier, and as my life started to unfold, everything started to come together, which really illustrated a very personal side. I liked that a lot. For me it was a little bit scary, because I knew that I was going into uncharted territory and I was being a little more autobiographical with the way that I wrote. It was more personal,” she says. The back cover of Soul Wide Open depicts Katrin by broken and abandoned railway tracks, with an old building barely visible in the background, she is carrying her acoustic guitar in one hand and dressed in a shiny gold colored long, skirt and a bluish – light purple jacket. “The back cover was taken in the Wooster area. It was a staged photograph, but it is interesting that we chose these really old railroad tracks, near an old building and we set up the lights and everything to get a specific shot. That had kind of a haunting feeling in the way that I was dressed, with the sheen of my outfit in this derelict type of environment that had a torn up railroad track type of look and that symbolizes to me rising above anything that you have had to deal with in life and just coming out on top. That was a neat concept for me,” explains Katrin. The scene depicted on the back cover of Soul Wide Open, reflects the mood and the message of the second track "One Year's Time." Katrin talks about that song, "The vocal melody came to mind first and mostly the chorus is what came to mined. I actually wrote that song with a visula concept in mind, as I collaborated with a person named David Smith who is a videographer. He contacted me about doing a new video. He had a concept about riding a bicycle and holding on. It was a metaphor for what can happen to a person in one year's time and (having the ability) to keep riding through it. That is also the way that Katrin describes the scene that unfolds as you open the CD jacket and look inside where she is standing in front of a brick building in jeans, black boots and a black jacket, with a patterned green scarf about her neck, while playing her guitar. She says, “The inside cover was just me strumming the guitar and smiling and having a good time, which is the way that I usually am, when I am on stage. In terms of her musical style, Katrin says, “I feel like I have been a sponge for music and I don’t feel that I ever jumped on one particular musical bandwagon. When I was learning how to play the guitar, it was like I almost needed to be filled up with all kinds of music. Sometimes it just seeps in and then it pours out of me, and I need to be filled back up again. I think that sometimes I have a blues type of a sound in the way that I sing and so I emulate that. I love Eric Clapton and artists like that, but I don’t necessarily adhere to their style. Like I say, I am always being influenced by all the types of music that are around me. In the late summer and early fall of 2009, Katrin toured Austria, Switzerland, Italy and France for one month and it was while on that tour, that she unveiled her new song “Home,” for the first time and she says it was received very well by those who attended her concerts. One of the hotels at which she was staying had a four song demo, including “Home,” being played on a continuous loop throughout the elevators and the lobbies. She says that she began to think of the song, which is one of her favorites, as representing a new chapter in her life.